Since the 1990s, when Dinn Mann became sports editor (he went on to run Major League Baseball’s website), The Star has been known for its witty, double-entendre sports headlines. During the last dozen years of the newspaper industry’s (and The Star’s) downward spiral, that has been one aspect of the paper that has not ebbed. 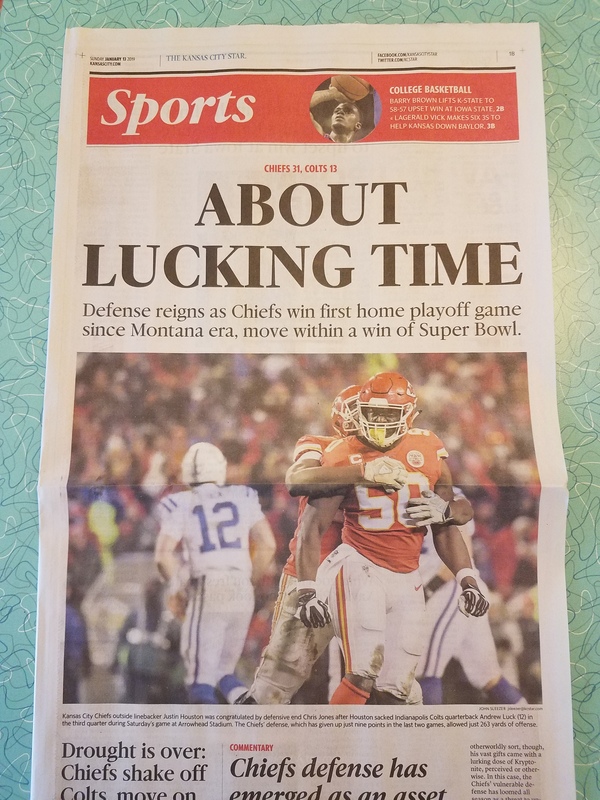 After yesterday’s huge Chiefs’ win, I was looking forward to seeing today’s print edition (that’s the only way you get the full effect) to see what sports editor Jeff Rosen and his team would come up with. 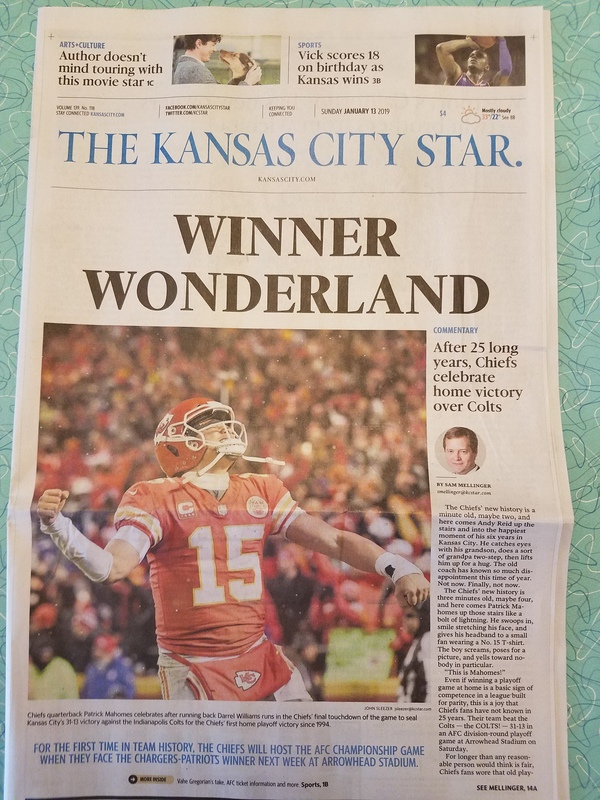 For those of you who don’t get the print edition, or are out of town, or couldn’t fish the paper out of the snow drifts, here are the headlines from yesterday’s memorable win over the Indianapolis Colts. Jim I violated my no pro football pledge that I took at your urging to watch the Chiefs. They did not disappoint. Now let’s see if the Star gets any blow back about headline #2. Tom, I have to confess, I broke my vow, too…Hard to stay away from a game and player (Mahomes) like that. I applaud their guts on headline No. 2. I would love to know how far up the chain of command they went for approvals. Certainly, Mike Fannin, editor and former sports editor, gave the green light, and I’ll bet they even ran it by Publisher Tony Berg. Bravo! You should have been a copy editor, Marcie. Two excellent puns there! Love the headline. Too bad I didn’t get to see it; haven’t received a paper since Friday. Both headlines were submitted by Twitter users. Credit goes to Mack Molloy (Winter Wonderland) and Tom Platts (About Lucking Time). Thanks, Kurt…Not being on Twitter, I had no idea they solicited headline suggestions. Great idea. And congratulations to Tom Platts and Mack Molloy. Loved “About Lucking Time.” Clever and funny! That’s a good one, Bob, but the beauty of “About lucking time” is it captures Chiefs’ fans 25 years of frustration. Don’t like “about lucking time.” KInd of like a Robin Williams routine—throw in enough clever allusions rapidly and it obscures the fact that it oesn’t make any sense. The parts are clever, (and “lucking” is naughty in a locker room macho way ) but they don’t add up to an effective whole. If I hadn’t seen the game, I would think the headline meant that Andrew Luck played some pivotal part in the game. He was a non-factor.